Very funny moments happen throughout (the Batman Lego Movie), so you can’t help but walk away afterward with a smile on your face. There are the occasional lighthearted jabs and the inside jokes for those well versed in the superhero world but even little ones who don’t know the hints will still love the film. Why would anyone come up with the idea to take popular characters made out of animated Legos and make it into a movie? Who would want to go see it? Well, in 2014, those questions were answered when Warner Bros created The Lego Movie. The film was a smashing success, so two and a half years later they are back with The Lego Batman Movie begging the question, would the sequel live up to its predecessor? I'm happy to say it does. As the film opens, The Joker (Zach Galifianakis; The Hangover) has taken hold of a plane full of high powered weapons and is threatening to blow up Gotham City unless the Mayor (Mariah Carey; Precious) surrenders. Stalling, the police call for Batman (Will Arnett; Arrested Development) who is nowhere to be found. Once the Mayor is inside the power plant, she removes the mask and reveals that it is actually Batman in disguise. An epic battle ensues with Batman capturing the Joker only to let him go when the Joker suggests he and Batman are in a kind of relationship where the Joker is Batman's greatest enemy. Suddenly, Batman is having an existential crisis while trying to stop the villains from executing Joker's evil plan. He also picks up some "sidekicks" along the way, including Robin (Michael Cera; Superbad) and Batgirl (Rosario Dawson; Seven Pounds). Only once he learns to be a team player, and to rely on others to help him, can Batman and friends save the City. With a superstar cast, The Lego Batman Movie is a joy to watch. Arnett's gravelly voice gives the perfect gravitas to Batman's loner/superhero façade. While it is supposed to make him seem tougher and more mysterious, it can also grate on the nerves a little. Galifianakis's comedic timing is well utilized as Batman's archenemy. Cera and Dawson round out this group nicely and there are a number of "cameos" that are well placed and funny. The animation is terrific and the 2160p video is enjoyable although, at some points, the higher resolution seemed to come across a little blurry. The colors and full and vibrant and run the spectrum. The Dolby Atmos audio is superb with the explosions coming from the surround sound and the dialogue clearly heard. The music is an auditory delight and ranged from heavy metal guitar solos to pop song. There are a number of extras on the Blu-ray disc for audiences to enjoy. 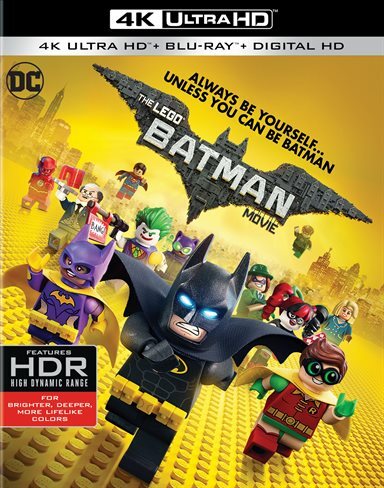 They include deleted scenes, 6 featurettes – One brick at a time: Making the Lego Batman Movie, inside Wayne Manor, Behind the Brick, Me and my Minifig, Rebrick contest winners, and Brick by Brick: Making of the Lego Batman – and 4 original short films- Dark Hoser, Batman is just not that into you, Cooking with Alfred, and The Master: a Lego Ninjago short. Some of the extras are really interesting especially if you like the art of graphic design and animation. The script is well done, which makes the film so enjoyable. Very funny moments happen throughout, so you can't help but walk away afterward with a smile on your face. There are the occasional lighthearted jabs and the inside jokes for those well versed in the superhero world but even little ones who don't know the hints will still love the film. There is action, humor, and heart all rolled into a neatly animated story and this second installment into the animated Lego world lives up to its predecessor in almost every way. I can't wait to see what the creators come up with next. Download Batman Lego Movie from the iTunes Store in Digial HD. For more information about Batman Lego Movie visit the FlickDirect Movie Database.